Ageing is a natural process, but it has become a social problem. Attributing a person’s inability to ageism is very common. One of the classic examples would be that of a senior walking on the sidewalk who trips and has a fall. What do you think would be the immediate reaction of the passers-by? This is why old people need to stay indoors and do things they are capable of!! One foot in the grave and behaving like a sixteen year old!! So we see that the society decides the lifestyle choices of a senior. Even a youngster might have had a fall, but we would attribute that to negligence!! Geriatric studies have proved that if a person is positive and people around them also are positive, their longevity increases by seven and a half years! Even the onset of Alzheimers is delayed if they are socially active. It is unfortunate that we look at them with a different eye! So true is the quote “People don’t die of old age, they die of neglect”! So to defy the myth about ageism and reinforce that age is just a number, “A tribute to those we salute”, an event involving JUNIORS and SENIORS was premiered by Theatre for change, on November 14th, 2016 at the Nightingales seniors centre to commemorate Children’s Day. The objective of this event was to remove the stereotype “generation gap” and include “generational connect” in our dictionary!! 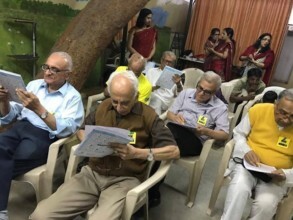 Children from schools across Bangalore who were a part of this noble cause underwent an orientation program where each one had to contribute their views on grandparents and other aspects related to ageism. Being a part of this process sensitised them and parents expressed their gratitude by saying that this experience had made their child a better person. They also requested that more of such social issues need to be addressed through theatre which will in turn groom them into socially responsible citizens. Besides this, we were keen on providing a platform for the seniors to relive their yesteryears. The event was in the format of participative theatre and involved a dialogue unlike a monologue in conventional theatre. A skit was staged where youngsters were faced with a problem and they turn to their grandparents for resolution. The seniors got the opportunity of stepping on stage and with their age-old experience resolved the problems of the children. The seniors proved that “Age is just a number” with their active participation in the “gamesercises”, which activated their mind and body. Spectators transformed into Spect-actors(Augusto Boal) and rocked the stage. In all, it was a fun-filled evening for both the ages! Last but not the least, this event wouldn’t have been possible without the support of the wonderful parents, children of my apartment community and Soroptimist International of Bangalore, an international women’s global service organisation. 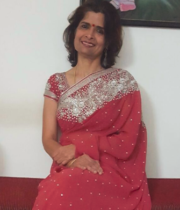 The author Sujatha Balakrishnan is a teacher/counselor and a theatre actor based in Bangalore who is the founder of Theatre for Change that helps address and senstitize us and more importantly our children to social issues and ISMs in a theartrical format. Disclaimer: The views and opinions expressed in this article are those of the author and do not necessarily reflect the views of The Wonder Women World. Thanks ma’am! If I’m right, I met you at the card room in Galaxy last evening!